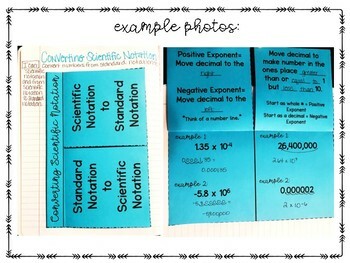 Converting Scientific Notation doesn't have to be hard for your students! 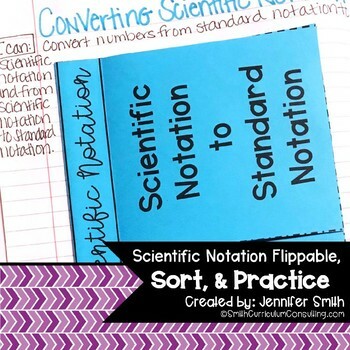 In this Interactive Notebook Lesson students will not only take fill-in-the-blank notes on Converting Standard Notation to Scientific Notation but also notes on Converting Scientific Notation to Standard Notation followed by a couple of examples for each. 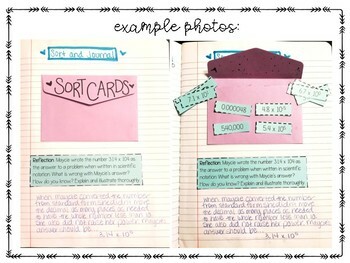 Once complete they will be able to continue with a sort where they match numbers written in standard notation as well as scientific notation. And no Interactive Notebook lesson would be complete with out some sort of reflection. This reflection will really make your students LOOK deeply into what is being asked! 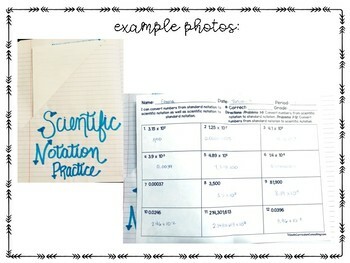 ★ Scientific Notation Practice Sheet with "I Can" statement "I can convert number from standard notation to scientific notation as well as scientific notation to standard notation." Once the students review the process of converting from scientific notation to standard notation (and vice versa) they are able to practice the steps together through the practice sheet.